Happy 69th birthday for Queen Margrethe! 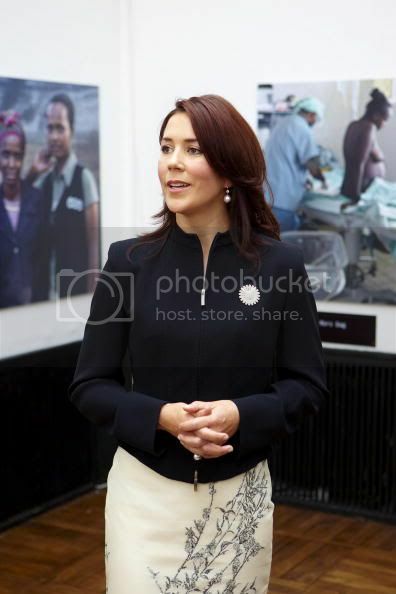 As Princess Marie and Prince Joachim were taking their safely delivered new little prince home on Thursday, May 7, 2009, Crown Princess Mary opened a photo exhibition in aid of the charity Maternity Worldwide at Lauritz Kunsthal in Copenhagen, Denmark. The aim of Maternity Worldwide (MWW) is to fund programs and campaigns to save lives in childbirth. MWW's goal is to save women's and children's lives during pregnancy and childbirth in Ethiopia where there is a one in seven mortality rate due to pregnancy and childbirth. Set up by six Danish working women in their 30s in 2005, MWW now works from a hospital in the town of Gimbie serving a population in the surrounding area of about 1 million. The work is voluntary and all money raised goes in full to the work in Ethiopia. MWW has co-inciding goals with those of the United Nations Development Goals projects to reduce mortality in women and infants. All countries agree that the effort against poverty starts with women and children and MWW guarantees the operation of the maternity ward at the Gimbie Hospital; the Safe Birth project, which guarantees women access to a safe delivery through education and vouchers for maternity services; the birth control project, which guarantees women access to choice when they will be pregnant and how many children they will have; and the Fistula project, which helps women who have experienced disabling damage during birth. The photo exhibition features the work of Anne Prytz Schaldemose who has photographed the work at the maternity ward in Gimbie. It's my pleasure to open Maternity Worldwide's exhibition RED EN MORS LIV by artist and photographer Anne Prytz Schaldemose. The pictures in the exhibition tell of Maternity Worldwide's effort in west Ethiopia, where pregnancy and birth are the cause of death for 1 in 7 women. It's risking life for the women go through pregnancies and births. This unacceptably high maternal and infant mortality is due to a general a lack of priority for women's health and lives - and more concretely is a combination of want of basic obstetric aid, very few hospitals in a huge country, poverty and greatly limited access to a birth control. A woman dies during pregnancy and birth every minute in developing countries. "When a woman becomes pregnant, she stands with one leg in the grave," were the words of the obstetrician Dr. Grace Kodingo from Chad, who was a visitor at a seminar I was present at earlier on this week. A very inspiring woman, who lives with the frustration everyday that she has the skills and knowledge to save life, but her environment prevents it. You could clearly feel her frustration. For us in this part of the world is it difficult to understand that it's with very life at stake that a woman becomes pregnant or has to feed. It's one of the world's most overlooked human disasters. Luckily we can do something. Maternity Woldwide was founded in 2005 by six Danish women with the intention of saving these women's lives. Their effort helps to show that it's possible to make a difference about giving priority to women's health and life. At Maternity Woldwide's hospital in Gimbie pregnant women arrive daily who have travelled a journey of many days on foot with labour pains or have been carried by relatives. Often the trip has been too hard/long for the unborn child, and it's already dead on arrival. The task for the hospital's employees is to do what they can so that the mother survives, so that she can take care of her other children. The woman is the key figure in the famillies of developing countries. If the children that constitute the third world's future become motherless it has catastrophic consequences for the child, such as lack of schooling, lack of social network and a greater probability for a life in crime or prostitution. An vicious circle has been created, with extensive consequences for society. A reduction of maternal and infant mortality therefore is an important point in the global agenda. It's for instance one of the UN's eight global goals for development that is to be fulfilled before 2015. But to save the mothers' life is a huge challenge - only 10 percent of the 2015 goals been managed to be achieved since 2000. It calls for a long-term, extensive and sustainable effort to reduce maternal and infant mortality. But at the same time it can to be seen that minor initiatives can also make a great difference. Maternity Worldwide's effort is workable - focused on help and self-help. There are several things which make Maternity Worldwide's effort viable. It is about securing life-saving medicine and employment of a local obstetrician who co-operates with visiting Danish obstetricians, so that Maternity Worldwide does what they can do at the hospital in Gimbie and so the women who come, survive. Ninety eight percent of all births happen in the villages, so the benefit is for the few women who reach the hospital and the project must focus on the many women in the villages. In the villages they have established groups of women, who among other things, are trained in safe deliveries by learning about danger signals that are the reason why you have to consult a doctor. But an important thing is to learn to understand when to seek professional help. Something else is at issue when a stay in hospital costs by far more than most families' annual income. Therefore it's a considerable part of Maternity Worldwide's project to pay these expenses. To begin with, by making the price a payable level and in the longer term by strengthening the work for a priority on women's health and lives. It's with pleasure that with the opening of the exhibition I also mark the beginning of Maternity Worldwides mother's day's campaign 2009 "Save a Mother's Life on Mothers Day". Hamlin Fistula Relief & Aid Fund based on the inspiring work of Dr Catherine Hamlin (see the ABC's Talking Heads). Just google her!